At Hercules Fence, our standard colors include white, black, bronze, and dark green. Are you in the market for a new fence for your yard? A fence could be a tremendous addition to your landscape, as they can provide a homeowner with privacy, security, and curb appeal. There is a multitude of fencing options available today such as wood and vinyl. Ornamental steel fences are commonly used for commercial properties, but could be perfect for your residential property as well! 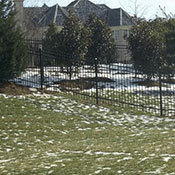 Continue reading and discover why an ornamental fence should be in your properties future! Steel is one of the strongest materials on the face of the earth. It is commonly used for building structures because it can withstand the elements and hold up to the test of time by withstanding various weather conditions. If you want a fence that is going to last you forever, steel is arguably one of your best options to consider. After your steel ornamental fence is installed, all you need to do is to enjoy it and provide it with minimal maintenance over the years. Chances are not many people in your neighborhood have ornamental steel fences around their properties. Most homeowners nowadays tend to go with traditional wood fences or vinyl fences for their landscapes instead. If you want to break away from the rest of your neighborhood, an ornament steel fence could be the addition that adds some flair to your landscape and separates your home from your neighbors. This entry was posted on Friday, February 8th, 2019 at 2:46 pm. Both comments and pings are currently closed.